"It was a little cloudy, sometimes the sun peeking through," he recalled. "I think the Dempster is one of the most breathtaking places I've worked. Big mountains all around you — big valleys." Porter and his team were able to show that Yukon summer temperatures in recent decades are the warmest they've ever been in the 13,600-year period. The report is just one of a series of recent studies indicating that Canada's North is warming faster than the rest of the world. It confirms previous, separate research, but was also a groundbreaking form of permafrost analysis. "[The study] kind of shows the world, shows the research community that, 'Wow, look, you can do this in places that don't have glaciers,'" said Porter. "And that's really exciting for me." 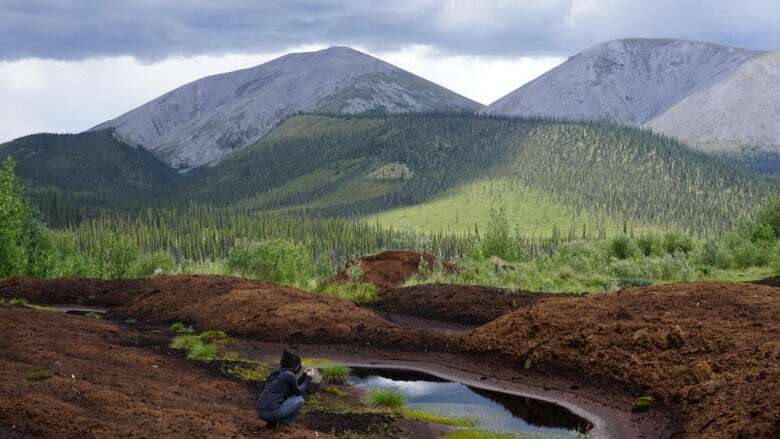 The successful new technique and the study's disarming revelations for Yukon are thanks to the team's six years of analysis and data processing in academic labs — but their roots stem from that lush and muddy summer 2013 research trip. "It's my favourite time of year, really. You know, we have a lot of very serious jobs around the university, teaching and grading and [going to] meetings," said Porter. "But going into the field is just nothing else really matters." He said they all felt the significance of the "incredible archive that's coming out of the ground." Porter admitted he's used to working on samples that are "a lot older" than 13,600 years. "But it still feels special to hold in my hands and say, 'Look. This is a really important time period that we're going to be able to understand with this sample.'" After calculating temperatures in central Yukon for the last 13,600 years, Porter and his co-authors said in a news release that it is clear "industrial-era warming has led to current summer temperatures that are unprecedented" and exceed "all previous maximum temperatures by nearly 2 degrees Celsius." Porter's technique works, but the warming trend it reveals also puts the very permafrost it relies on at risk. "Some of these sites will reach these critical temperatures where they just start thawing, and you do start losing that record," he said. "I guess that's really more justification for us to get out there and save these records before they're all gone."